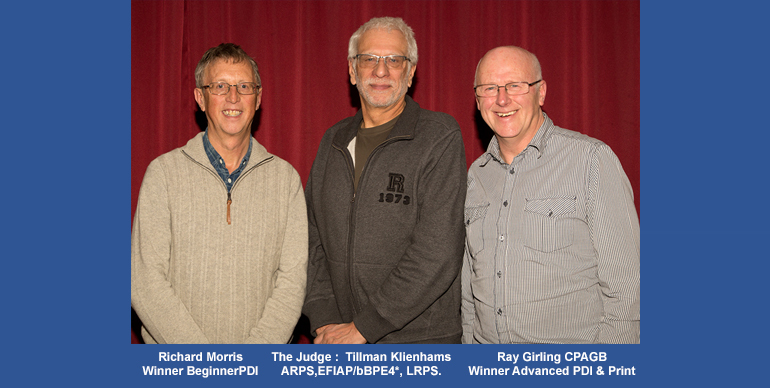 MID-CHESHIRE CAMERA CLUB: Annual Theme Competition "Mono"
Chairman Ray Hill welcomed experienced L&CPU judge Tillman Kleinhans who had come along from St. Helens Camera Club to judge this year’s “mono” theme competition. Ray explained that mono had been chosen as it is growing in popularity with clubs in the L&CPU yet few MCCC members have tackled it in the past. Tillman started out by reminding us that his judging is only his opinion and that what really matters is how we feel about our images. Advanced Prints were the first to be considered and Tillman congratulated the 6 authors about the quality of their 19 entries which covered a wide range of subjects. The winning image was Ray Girling’s gentle landscape “Walk in the Fog” which Tillman said he would happily have on his wall with “Stepping Out” by Kath Hill in 2nd place. Then 4 Beginners went head to head for the first of the Projected Digital Image (PDI) sections and the winning image was “Whitby Gulls” by Richard Morris with 2nd place going to Matthew Eagles with “Follow the Leader”. After a break for coffee and a chat, Tillman settled down to view 36 PDI’s from the Advanced section. His was no easy task but as before the break he gave each image a thorough critique explaining what he liked about the image and suggesting ways in which it might have been improved. In the end he chose Ray Girling’s urban image “Minder”as the winner followed by “Dawn Patrol” from Ian Whiston in 2nd place. Ray Hill thanked Tillman for his judging which was both entertaining and informative and thanked all members for putting forward such a fine selection of images. He then invited Tillman to choose the topic for next year’s Annual Theme Competition. Tillman explained that as he loves to photograph rotting wood and rusty metal he had decided on the theme of “Beauty in Decay” and he also agreed to come back next year to judge it. Once again it was an entertaining and informative evening.